A brief summary of events already had in January. For the most part, this is the time of year when most activities slow to a crawl (unless you’ve got a good few pairs of thermals to wear, in which case you’re observing is limited by conditions and the build-up of water vapor as you breath too close to an eyepiece). With the Friday night session a complete wash at Baltimore Woods, Bob Piekiel and I ran a double on Saturday, January 9th. 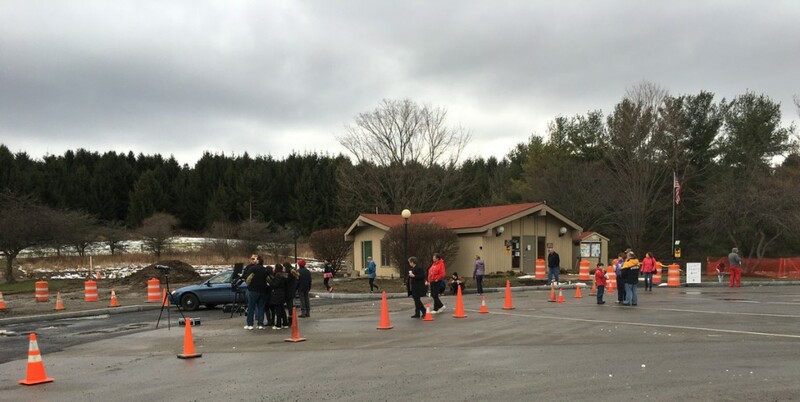 The first event was a solar observing run at Green Lakes State Park (amid current construction around the main building). Sadly, this was the best-attended failed session yet, with considerable cloud cover only providing the most fleeting glimpse of the Sun before taking it away again. Attendance peaked near 25, though, which is great news otherwise. Bob will be running (and I wing-man’ing) a few more solar sessions, for which we hope the skies agree at least once. Observers observing, but not as planned @ Green Lakes. Click for a larger view. I am pleased to mention that, near the end of the session, a few mountain bikers came by the scopes to ask what we were looking at. When I said it was a failed solar observing session, one of the bikers (in an SOS shirt) mentioned that he had learned some observing with “A guy named Stu.” Taking a few minutes to remember local amateur astronomer extraordinare Stu Forster was a treat that made my otherwise overcast day. 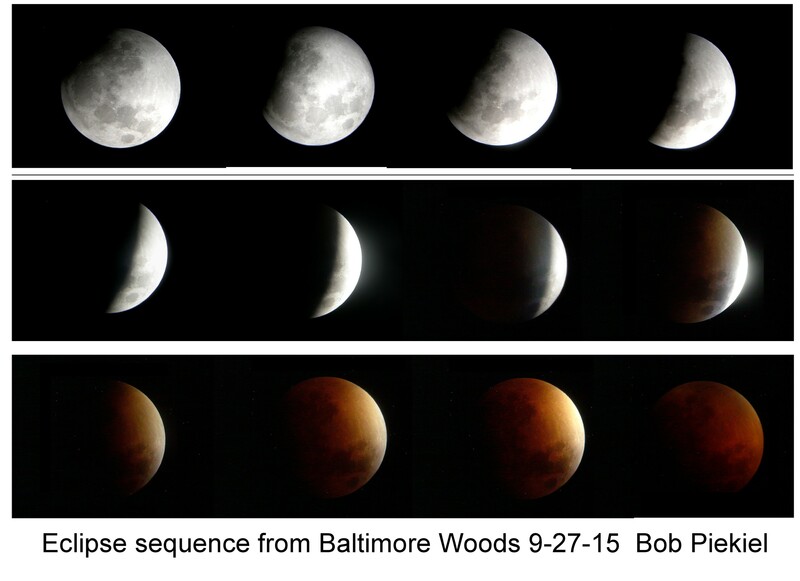 Later that night, during what was maybe-sort-of predicted to be an opening in the sky from 7 to 8, Bob and I waited patiently at Baltimore Woods for his monthly New Moon weekend session. We went with hope, then left with 90 minutes remaining in the session as the cloud cover only got worse-and-worse. Our loss was other’s gain, of course – as we’ve had a few previous January sessions that were painfully cold but clear. 2016 has started warm but painfully cloudy. 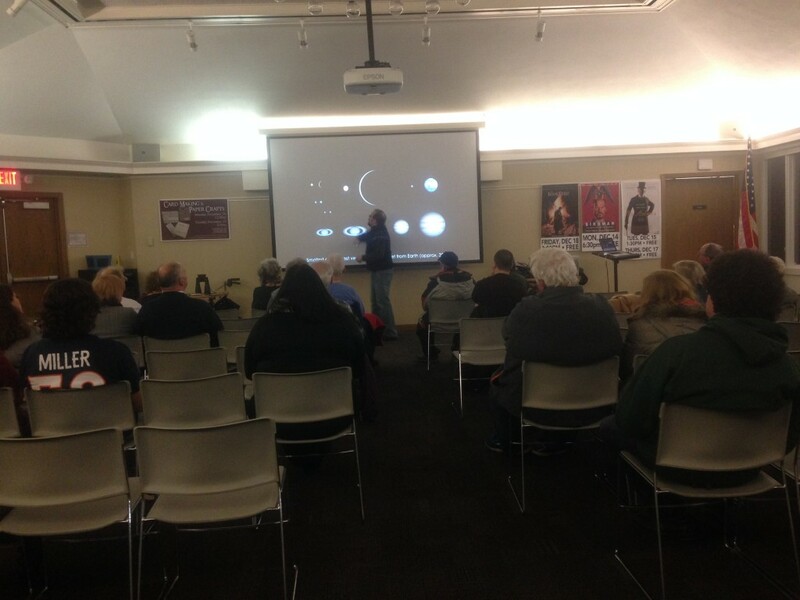 The lecture given at DeWitt Community Library for our fellow science-minded friends in CNY Skeptics was a repeat (mostly) of the Ceres & Pluto lecture given at Liverpool Public Library late last year. With a few new pics and the benefit of one full pass of the lecture, this session went fairly well (minus at least one softball-stump-the-speaker question). Plans are already in the works for a few more lectures, including one at DPL for the non-affiliated library audience. A view from the CNYO table (and a Meteor Game). Click for a larger view. 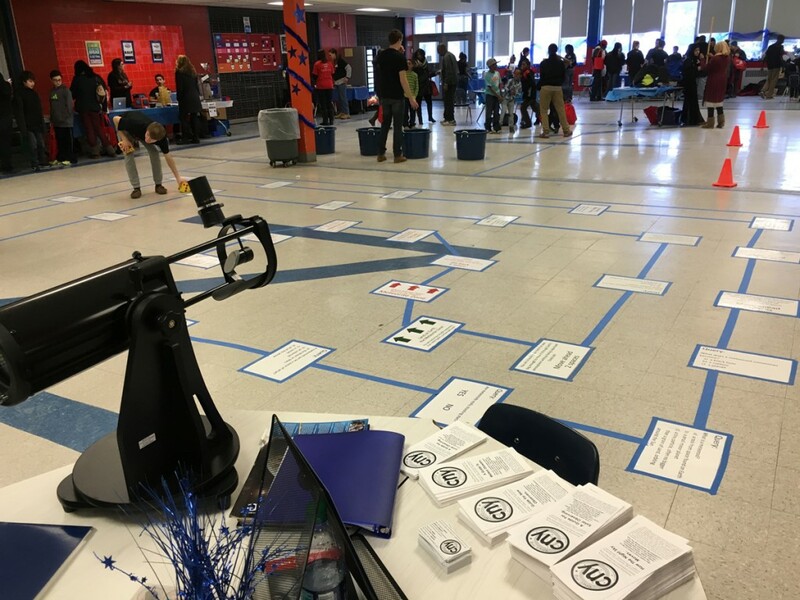 This past Saturday, CNYO hosted a strategically-placed table to talk astro-shop for a third MLK Community Day Celebration in a row (with continued thanks to STEM Superstar Mary Eileen Wood for the invitation to the event at Nottingham High School). With brochures, Prof. John McMahon’s graciously donated table-top scope (and a 38mm eyepiece to be able to get *anything* into focus in the background), Mars and Ceres pebbles, and a gyroscope in tow, we had about 50 kids and adults stop by over the course of the 2 hour 30 min event. Directly behind us, Dr. David Wormuth made a guest appearance and put his surgical skills to the test (well, not really) in a live demo for the attending audience.